Used by combat trained medics. 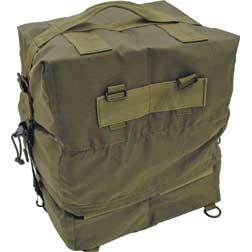 Comes in an OD green nylon backpack (measuring approximately 13" x 13" x 10") with hand carry straps. Closes securely using four adjustable chinch straps. The bag rolls open to reveal its contents contained within one of its six individual interior pockets inside its three-fold design. There is also one exterior pocket that is secured by a Velcro flap. Contains over 300 items including an assortment of bandages, wraps, ointments, medicine, ice packs, syringes, latex gloves, safety pins, pill bottles, tape, cotton tips, hemostats, sponges, airways, wipes, inhalants and suture sets. Kit also includes a CPR mask, tongue depressor, thermometer, first aid book, arm splint, blood stopper kit, stethoscope, blood pressure kit, pen light, EMT shears, tweezers, skin probe and scalpel. Excellent kit for home, office or vehicle. Weighs 15 lbs.